Jeanell Carrigan studied in Australia, Germany and Switzerland and has been heralded as one of the most sensitive and dextrous pianists to have arrived on the Sydney scene for some time' (Sydney Morning Herald). She has recently completed a Doctorate of Creative Arts in music performance at the University of Wollongong, and is currently a member of staff at the Australian Institute of Music. 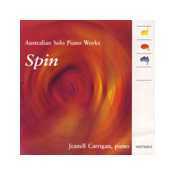 For more information on this CD visit the Australian Music Centre website.